Finally! Half a decade after Pauline Souleau and I first began discussing the issue of performativity in medieval lyric, our collection of essays (co-edited with Ardis Butterfield) has now appeared with Legenda. We’re truly grateful to the volume’s authors who have allowed us to explore the notion of performance from so many different angles: from 10th-century skaldic poetry (Annemari Ferreira) to the Augsburg Adventus of 1530 (Moritz Kelber); from the visual representation of Christine de Pizan’s ambiguous authorship (Charlotte E. Cooper) and Job’s non-representation as a musician (Franz Körndle) to the imagined performance of the psalms in Dante’s Purgatorio (Jennifer Rushworth); from the felicitous performance of the sacraments (Matthew Cheung Salisbury) to the creation of fuzzy identities in songs (Catherine Léglu); from the theoretical reconsideration of ‘performing manuscripts’ (Elizabeth Eva Leach) to the performance of genre in thirteenth-century motets (Matthew P. Thomson). Thanks to these diverse contributions and the generous funding from New College (Oxford) and the Mariann Steegmann Stiftung (Bern), the volume is able to ‘[establish] the Middle Ages as a fecund, privileged site for the exploration of performance, without limiting medieval culture to performance and without wishing to restrict performance to this period; it suggests the possibility of transcending disciplinary boundaries and the opportunities for interdisciplinary exchange in relation to performance; and it calls for a continued, collaborative discussion on the processes involved in the performance of medieval texts’ (from the Introduction). On 22 September 1967, 50 years ago, the musicologist Friedrich Gennrich passed away. This blog post is the first of two which hope to bring his work back into the critical limelight of scholarly attention. Curiously, the Wikipedia entry on Friedrich Gennrich (currently available in German and Russian) suggests that his academic achievements relate one-dimensionally to the study of medieval French (and Occitan) song. Gennrich studied Romance philology with Gustav Gröber and, for his doctoral degree, prepared an edition of the fourteenth-century French romance Le Romans de la Dame a la Lycorne et du Biau Chevalier au Lyon (published in 1908). His first independent monograph — Musikwissenschaft und romanische Philologie (Halle (Saale) 1918; re-published as an article in the Zeitschrift für romanische Philologie 39 in the following year) — still makes for interesting reading for anyone contemplating the relationship between musicology and literary disciplines. Yet by the mid-1920s, Gennrich’s interest had expanded beyond the remit of Romance song traditions to include the German repertoire of Minnesang in his research. His first publication on Minnesang appeared in the Zeitschrift für Musikwissenschaft 7 in 1924/25 (‘Sieben Melodien zu mittelhochdeutschen Minneliedern’), and this interest in Minnesang continued throughout Gennrich’s academic career, with further important discussions and editions published in 1948, 1951, and 1954 (‘Liedkontrafakturen in mittelhochdeutscher und althochdeutscher Zeit’, Zeitschrift für deutsches Altertum und deutsche Literatur 82; Troubadours, Trouvères, Minne- und Meistergesang (= Das Musikwerk, vol. 2), translated into English in 1960; Mittelhochdeutsche Liedkunst: 24 Melodien zu mittelhochdeutschen Liedern (= Musikwissenschaftliche Studien-Bibliothek, vol. 10)). Gennrich’s interest in the German song repertoire was kindled by his belief in the international exchange of song melodies during the twelfth and thirteenth centuries. This exchange, Gennrich argued, was manifest in the survival of German songs that followed French poetic models and used their melodies, so-called contrafacta. Much of Gennrich’s academic work was dedicated to hunting such contrafacta within the Minnesang repertoire, culminating in the publication of Die Kontrafaktur im Liedschaffen des Mittelalters (= Summa Musicae Medii Aevi, vol. 12, Langen bei Frankfurt 1965), which to this day remains the sole comprehensive study of medieval practices of contrafacture. The phenomenon of international exchange took centre stage already in Gennrich’s ‘Sieben Melodien’ article of 1924/25. Here, he called attention to one particular event that, so he believed, was a representative example of the many situations in which Minnesänger could have met their French counterparts: the Hoffest of 1184, that drew nobility from across (and beyond) the realm of the Holy Roman Emperor Friedrich I (now better known by his nickname Barbarossa) to Mainz. Gennrich reiterated Gustav Gröber’s claim that the trouvère Guiot de Provins had also been present at the Hoffest and linked Guiot — albeit subtely and without any further eloboration — with the Minnesänger Heinrich von Veldeke. In his subsequent publications, Gennrich repeatedly fostered, expanded, and generalised the assumption that the 1184 Hoffest had been a place of international exchange. His view quickly became commonplace within musicology and German literary studies and is still firmly embedded in present-day scholarship (see, for example, Heinz Sieburg’s Literatur des Mittelalters, 2nd edition, Berlin 2012, p. 27). Probing this narrative, however, reveals that it is based on shaky evidence: the presence of Guiot de Provins and Heinrich von Veldeke in Mainz is insinuated by references to the Hoffest in the poets’ own literary works, La Bible and the Eneit, but none of the numerous chronicles that provide an account of the Mainz festivities confirm the presence of Guiot or Heinrich. 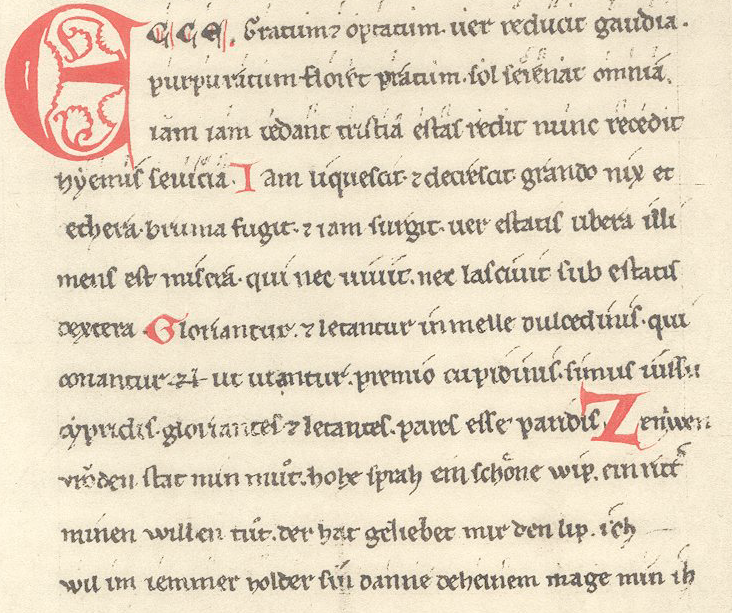 The only mention of entertainment at the Hoffest seems to be the reference to ‘ioculatores et ioculatrices’ made by the chronicler Gislebert of Mons (Gisleberti Chronicon Hanoniense, ed. by Wilhelm Arndt, Hanover 1869, p. 143). The context of Gislebert’s account, however, makes it unlikely that these ‘ioculatores et ioculatrices’ were courtly singers: instead, it is more probable that they were itinerant entertainers of low social rank, given that they were eager to receive alms for their performances by the nobles attending the Hoffest. Even if we are more generous in our scholarly suspension of disbelief, take Guiot’s/Heinrich’s word for it, and assume that the two poet-singers did actually attend the festivities in Mainz: their texts say nothing about a meeting between them — and even if they did meet, does it necessarily follow that contrafacta would have resulted from this encounter? While a face-to-face meeting between two singers might indeed have enabled such exchange, it is by no means a necessary requisite or even an automatic generator of contrafacta. And, for that matter, why are we so certain that Heinrich would have been inspired to write a new song on Guiot’s model, while Guiot would not have drawn any inspriation from this encounter? Many scholars have seen Heinrich’s ‘Ich denke under wîlen’ as the fruits of this asserted meeting between the two poet-singers in 1184. ‘Ich denke under wîlen’ shares the metric pattern of Guiot’s song ‘Ma joie premeraine’, leading Claudia Lauer (and others) to assume that the German song would have used the melody associated with its French model (‘Liebe übersetzt. Friedrichs von Hausen “Ich denke underwîlen” (MF 51,33) als (vor-)modernes Rezeptionsphänomen’, in: Die Aktualität der Vormoderne: Epochenentwürfe zwischen Alterität und Kontinuität (= Europa im Mittelalter: Abhandlungen und Beiträge zur historischen Komparatistik, vol. 23), ed. by Klaus Ridder and Steffen Patzold, Berlin 2013, pp. 207–230; esp. p. 218). There is, however, no manuscript evidence to prove such a claim: while ‘Ma joie premeraine’ is transmitted with a diastematic melody in the Chansonnier St-Germain-des-Prés (F-Pn fr. 20050, fol. 17r/v) and trouvère manuscript C (CH-BEb 389, fol. 147v; with staff, but without notation), the two sources for ‘Ich denke under wîlen’ offer no melody (Codex Manesse, D-HEu Pal. germ. 848, fol. 118v; and Weingartner Liederhandschrift, D-Sl HB XIII 1, p. 18). Moreover, Anton H. Touber has pointed out that there are (at least) 24 other songs in the trouvère corpus which use the same metrical pattern (‘Romanischer Einfluss auf den Minnesang: Friedrich von Hausen und die Hausenschule’, Beiträge zur Geschichte der deutschen Sprache und Literatur 127 (2008), pp. 62–81; esp. p. 64). If Heinrich did meld his ‘Ich denke under wîlen’ on a French model, it could have been any of these; the only evidence that could affirm any such link, however, would be the survival of identical melodies. So, where do these observations leave us? We cannot say with certainty whether Guiot de Provins or Heinrich von Veldeke were at Barbarossa’s Hoffest at Mainz in 1184; and, likewise, we cannot ascertain whether there is a direct relationship between ‘Ma joie premeraine’ and ‘Ich denke under wîlen’. Only once we acknowledge these gaps and uncertainties in our current knowledge, will scholarship on Minnesang and its music be able to move forward. The fiftieth anniversary of Friedrich Gennrich’s death provides an ideal moment for musicologists to take stock of what we know, what we think we know, as well as those things we thought we knew but no longer do. Since 1967, more historical sources have been found and made available to the public, and the digital age makes it much easier for us to find and connect information than it ever was for Gennrich and his generation. So we should not be afraid of the gaps we might uncover: doing so will allow us to ask questions old and new of these materials and to find fresh ways of answering them. ‘Das Mainzer Hoffest von 1184 und die Historiographie deutsch-französischen Kulturaustauschs im Minnesang’, in: Musik der mittelalterlichen Metropole: Räume, Identitäten und Kontexte der Musik in Köln und Mainz, ca. 900–1600 (= Beiträge zur rheinischen Musikgeschichte, vol. 179), ed. by Fabian Kolb, Kassel 2016, pp. 353–367. I am very grateful to Marc Lewon for encouraging me to tackle the narrative about Guiot, Heinrich, and Hoffest. Finally! After more than two years, it’s time for a new blog post. Indeed, the occassion for today’s blogpost is itself a finally!-moment: my first book chapter has just appeared in print as part of a volume on Manuscripts and Medieval Song edited by Helen Deeming and Elizabeth Eva Leach. To celebrate this special moment, I’ve also just added a new page to my blog, outlining a list of my current publications for you to explore. In my chapter for Manuscripts and Medieval Song, I take a fresh look at some of the full-folio author miniatures contained in the largest collection of medieval German poetry: the Codex Manesse. This beautiful manuscript has largely been ignored by musicologists to date since it does not contain any musical notation. The few notable exceptions to this general neglect include Marc Lewon and especially Dagmar Hoffmann-Axthelm, whose insightful article on the Frauenlob miniature in the Codex Manesse I discovered only a few weeks ago – unfortunately only after my article had already appeared in print. Despite it’s lack of notation, the Codex Manesse may well have been considered as a musical source, a Songbook, by its original users. The manuscript’s 137 author miniatures emphasise the orality of the song repertoire contained in the volume while making sure to underline the noble status and high, courtly artistry of the various Minnesänger by avoiding a too close association of the poet-musicians with unseemly performance. Instead, the Minnesänger are shown as the authors of their songs, granted ‘authority’ (auctoritas) by their own experience of the situations outlined in the songs. Much like modern-day hymnbooks (which frequently make do without notation) and CD covers (which rarely insist on an artist’s status as performer), the Codex Manesse could well have been considered a musical source by its users – even without explicit reference to music through notation or the depiction of (instrumental) performance. Indeed, the memories of these songs may not have needed to be notated in the first place – either they were already familiar to the manuscript’s users, or these lyric texts could be ‘brought to life’ with standard melodies or staple melodic patterns without much effort. If I’ve sparked your curiosity, you’re in luck: fortunately, much of my article can be read on Google Books. Let’s hope that it won’t be another two years before the release of my next blog post! Oculi omnium in te sperant, Domine; et tu das escam illorum in tempore opportuno. Aperis tu manum tuam, et imples omne animal benedictione. [Psalm 144, 15–16]. *For those really desperate to know, the last two years have included the submission of my doctorate; teaching, teaching, and more teaching, interspersed with a little bit of marking, pastoral duties, and just a ‘smidge’ of administrative tasks; writing sheer endless applications and attending interviews; organising a second conference and speaking at many more; scrambling to put together some of my research in publishable form; organising a 10-day concert-tour to the UK for the Landesjugendblasorchester Niedersachsen; …). Last week Catherine Bradley and I gave a joint presentation at the University of Oxford Medieval German Seminar, titled ‘Getting Music Into and Out Of the Codex Buranus’. The Codex Buranus, or the Carmina Burana (i.e. the songs of the Codex Buranus), has been the subject of investigation for the seminar this term, and while the group is principally comprised of literary scholars, Dr Almut Suerbaum was kind enough to invite a number of musicologists along to help establish the texts not only as texts but as songs. Now the first thing that comes to mind when thinking about the Carmina Burana is most often the overwhelming setting of some of its poems by twentieth-century composer Carl Orff, including the memorable chorus ‘O Fortuna’. Given the nature of my blog, you may not be surprised to learn that Orff wasn’t the focus of our presentation though! Orff simply set to music a selection of texts from the thirteenth-century Codex Buranus (dated around 1230) which gets its name from being held at the monastery of Benediktbeuern in Southern Germany before it was moved to the Bayerische Staatsbibliothek in Munich. The manuscript contains texts in Latin and Middle High German, ranging from love songs to drinking songs, to satire, and some very bawdy songs. The codex hasn’t received much attention from music scholars, however, mainly because of its problematic musical notation. The manuscript uses un-heighted or adiastematic neumes—in other words, it uses lots of perplexing little squiggles that aren’t placed on the lines of a stave and which seem to give no precise information about the pitch or rhythm of the melodies. As Catherine and I explored in more detail, scholarship has relied instead on music that survives for some of the Carmina Burana poems in later, more precisely notated sources, in order to reconstruct the music of the Codex Buranus. But what about songs for which no musical notation survives elsewhere? Can we get any information from the notation in the Codex Buranus itself? One of the texts famously set by Orff, Ecce gratum (CB 143) offers a particularly nice example of the way in which scholars can interpret musical structure in the Codex Buranus without knowing any precise musical details of pitch and rhythm. This is what the piece looks like in the manuscript (which can be found online as part of the Petrucci Music Library IMSLP). The song consists of four stanzas, three of which are in Latin, and a final stanza in German. Musical notation is provided (as you can see above) only for the first Latin stanza and the very end of the German one. The neumes for the first two lines of text, ‘Ecce gratum et optatum, ver reducit gaudia’, are identical to those for the second couplet: ‘purpuratum floret partum, sol serenat omnia’. We’ve labelled this music ‘A’. But as you can see there’s new musical material, which we’ve labelled ‘B’, for ‘iam iam cedant tristia’. This is followed by a short new phrase, C, which is set to both ‘estas redit’ and ‘nunc recedit’. The final line ‘hyemis sevicia’ has new music—but it is not as straightforward to make out whether this is completely new material, in which case it should be labelled ‘D’, or if this phrase might be a variation of the ‘B’ music, a sort of ‘B1’. This mini analysis already shows impressively that, even if we can never know what these songs really sounded like, or to what pitches or rhythms they were sung, the Codex Buranus can still be a very important and useful source of musical evidence: it has a wealth of information to offer, particularly concerning music-text relationships. As this tantalisingly suggests, a proper in-depth study of music in this manuscript will transform current understandings of medieval vernacular song: an undertaking which Catherine and I are both very excited about and hope to undertake some time in the near future! Medieval art – textual, visual, and aural – is inherently performative. Current research has taken a new interest in the performative nature of this period in history: the performance contexts/acts, the performers, the performance media, the performed identities of various kind. In turn, modern scholarship and art have themselves ‘performed’ this repertoire through its reception. Yet the explicit emphasis on the performative by modern scholars is somewhat at odds with the often implicit aspects of performance in medieval art. Performative elements, it seems, are so omnipresent and engrained in medieval culture that they are hardly worth emphasising. Together with Pauline Souleau, a fellow DPhil student in medieval French, I am hosting a conference for graduate students and early career researchers which seeks to re-address issues surrounding Performing Medieval Text. Aware of the strong role scholarship itself plays and has played in the performance of medieval art, the conference brings together young academics and established postholders: graduates will give 20-minute papers, to which researchers from the University of Oxford, including Prof. Elizabeth Eva Leach, Dr Sophie Marnette, and Dr Almut Suerbaum will respond. The conference will be framed by two keynote papers, one by the French scholar Dr Florence Bourgne, and one by the musicologist Prof. Dr. Franz Körndle. A conference lunch and reception will provide ample opportunity for interdisciplinary, international academic exchange outside the seminar room, and Marc Lewon will give a concert of medieval lyric and narrative poetry. We are currently seeking out possibilites of publishing the proceedings of the conference to ensure its lasting impact. The conference will take place at Merton College (Oxford) on 10–11 May 2013. The website is now live; there, you will find more information, contact details, and the Call for Papers (deadline 3 February 2013). Performing Medieval Text is supported by Merton College Oxford and the Royal Musical Association.